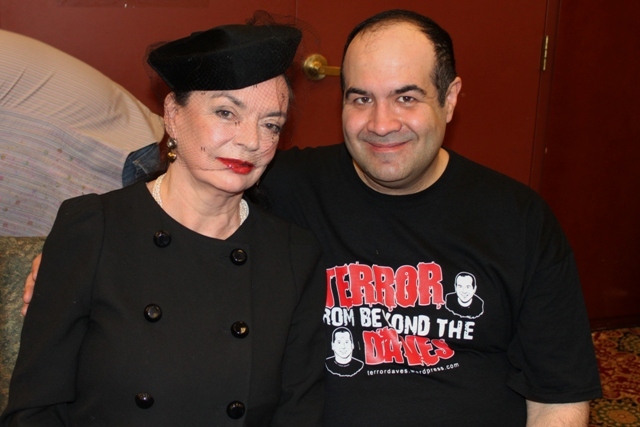 Meeting Barbara Steele at Horrorhound Weekend! This was despite hearing mixed reviews from people who stated she had a tendency to be a “diva” around her fans. My thoughts on this were – if you’re Barbara Steele you ARE a diva and can hardly be blamed for acting like one. Unlike Lisa Marie (see earlier post), we were fully prepared to let her snub us and would have considered it an honor for her to ash her cigarette over our heads! Fortunately, this wouldn’t be the case. Ms. Steele was very friendly and classy. I chose to have her sign a picture from her own collection of 8×10’s. 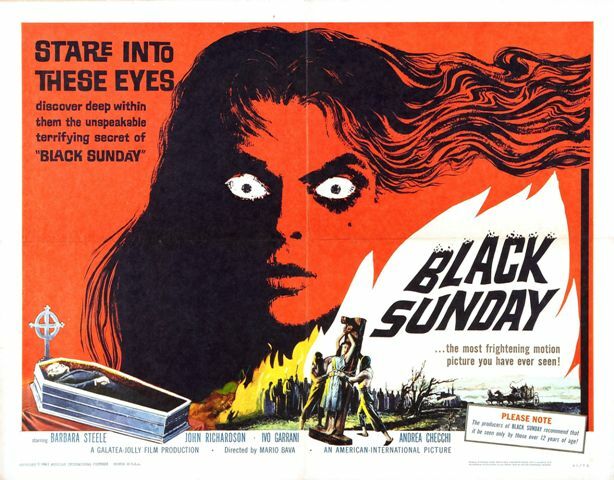 Prior to arriving, I had anticipated having her sign a BLACK SUNDAY photo. I would end up choosing a B&W still from THE PIT AND THE PENDULUM that included her co-star, Vincent Price. According to IMDB, Price injured Steele while throttling her in this scene….thought Steele would end up being a good sport about it. I asked her to write “Viva Italia” while she personalized my photo. “Are you Italian? What part of Italy does your family come from?” she asked. I explained that my mother’s side is, indeed, Italian and that her grandparents came from Lucca, Italy – located in the Tuscany region. “Ah,” she said. “You are very lucky to be from that part of the country.” Not sure what that meant, but I smiled and we posed for a photo. She really seemed impressed with the other Dave – David Albaugh. The minute he sat down she commented how good looking she thought he was. “Mama Mia! Order me that cannoli! 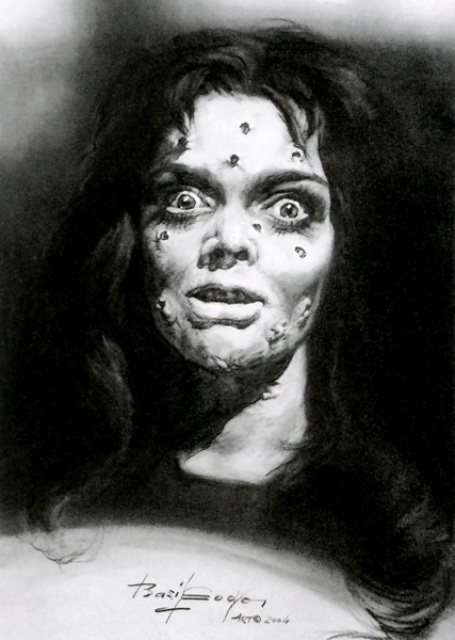 This entry was posted in Celebrity Encounters!, Convention & Expos and tagged Barbara Steele, Black Sunday, Indianapolis Horrorhound Weekend, Italian Horror, The Mask of Satan, The Pit and the Pendulum, VINCENT PRICE. Bookmark the permalink. 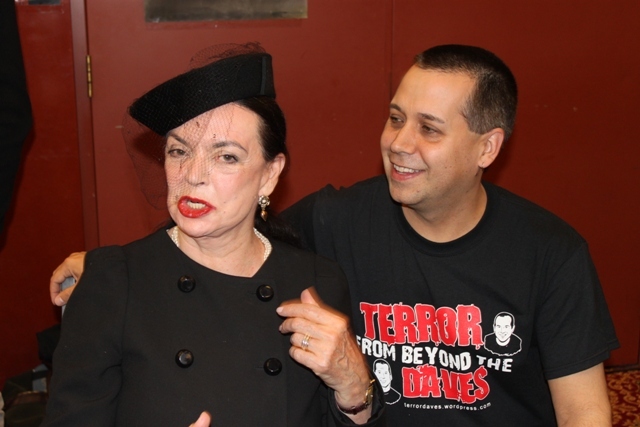 ← Horror Host Tribute to Chicago’s Shock Theatre MARVIN! 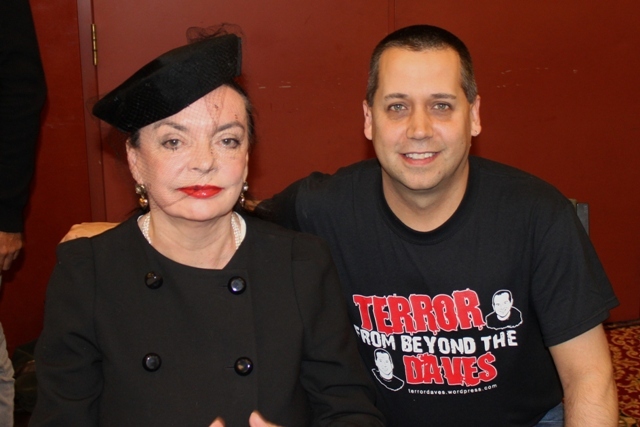 I also had the pleasure of meeting Barbara Steele at HorroHound in Indy that year. What a marvelous experience! She was very warm and friendly and it was one of the greatest experiences in my life. I was actually a little afraid to approach her, as I had heard she could be a little stand-off-ish with fans. But I was restrained and respectful and she gave me a lovely smile and held out her hand for me to take. I was totally entranced by her. An amazing actress and a very charming human being! Very well stated, Michael. I had heard the same things you did prior to meeting her so I was happy to discover that they weren’t true. Steele is a great lady and a true legend!